The Special Anti-Robbery Squad of the Lagos State Police Command has apprehended a 30-year-old man believed to have been the mastermind of two robberies at the Murtala Muhammed International Airport, Ikeja in 2012 and 2013. The suspect, Samuel Mayegun, aka Asiwaju, who claimed to be a graduate of Moshood Abiola Polytechnic, Abeokuta, Ogun State, was arrested in the Ikorodu area of Lagos last Thursday. PUNCH Metro had reported in April 2013 that about eight suspects stole over N400m from bureau de change operators at the airport in 2012 and went for another robbery the following year and carted away N9m. The police were able to arrest most of the suspects after the second robbery but it was learnt that Mayegun continued to evade arrest from policemen until he was arrested by policemen while attempting to stage another robbery. The suspect, who claimed to have made N45m from the robberies, said he continued to rob because all his investments had failed. He said his only regret was that he did not flee the country when he had the chance to. He said, “My regret is that I did not heed the advice of my friends who told me to run away from the country because N45m was enough to do good business abroad. The suspect, who claimed to be married with children, said he continued to rob because he was constantly losing money from his businesses. He said, “I invested some of my share in some businesses: I bought lands and trucks for transport business. Some of my share was taken from me by some street urchins who got wind of the robbery and threatened to report me to the police, so I gave them some money. Unfortunately, my transport business did not move well and I became broke. The suspect said all those who participated in the robbery were given N45m each except the informants at the airport who received N1m each. PUNCH Metro learnt that Mayegun was arrested by SARS men, led SP Abba Kyari, while he was staging another robbery with four others, identified as Biodun Adegayo, Ezekiel Anthony, Ibrahim Sado and Femi Osiyelu. Commissioner of Police, Umar Manko, while parading the suspects, said they were arrested based on a tip-off by a credible source. 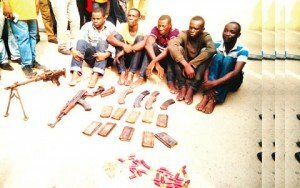 He said, “On that fateful day, we received a tip off about 2am that the notorious armed robber had left his hideout in Ijebu-Ode, Ogun State, for Ikorodu, Lagos, where they were planning a mega operation the next day. “We recovered one general purpose machine gun, one Ak47 rifle with serial number 533124, two double-barreled locally-made pistols, 10 GPMG and eight AK47 magazines respectively and 32 live cartridges. “During interrogation, Mayegun confessed to the robberies at the airport, where a bureau de change was robbed and millions of naira was carted away, and he admitted to getting N45m as his share. Manko said the suspect also confessed to participating in other robberies in both Lagos and some South West states and a bank robbery in Kwara State.